Nutrition-sensitive agriculture can lead to greater women’s empowerment among farming households. For example, along Bangladesh’s coastal belt, USAID’s multi-sectoral nutrition project, Strengthening Partnerships, Results and Innovations in Nutrition Globally (SPRING), used a multi-channel integrated approach to tackle malnutrition using both nutrition-specific and nutrition-sensitive interventions. With the Essential Nutrition Actions and Essential Hygiene Actions (ENA/EHA) as the technical foundation of our work, we developed a variety of interventions, grounded in existing evidence-based approaches, to tackle malnutrition, with a particular focus on the first 1,000 days between pregnancy and a child’s second birthday. Although we focused on enrolling pregnant and lactating women in our farmer nutrition schools (FNS), we recognized that these activities needed to be inclusive of both genders to be sustained. So, we worked with husbands, other family members and important influencers in the community to foster an environment that enables women to improve their family's nutrition through homestead food production and better child feeding and hygiene practices. After several years of implementation, our field staff noticed that women who had participated in SPRING’s program — particularly those who had participated in our FNS — seemed more confident, more in control of their family's health and diet, and better linked to the government extension system. Was it possible FNS improved nutrition AND increased women’s empowerment? 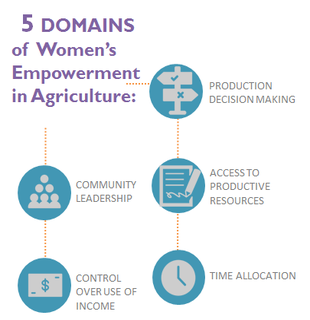 To answer that question, we used an adapted version of the Women’s Empowerment in Agriculture Index (WEAI), a survey-based aggregate index designed to measure women’s empowerment, agency and inclusion in the agriculture sector. Our research revealed that women who participated in FNS had higher empowerment scores than women who did not. We also learned that women exposed to SPRING interventions saw greater improvements in empowerment over time compared to women who did not participate. FNS sessions did not specifically address empowerment, but they did focus on indicators of empowerment, such as production decision-making, community leadership and control over income use. FNS modeled two other evidence-based approaches: homestead food production and farmer field schools, both of which have led to improvements in empowerment for women over time. It is, therefore, likely that improvements seen in the study were due to the approaches upon which the work was based. Compared to platforms that focus on community engagement or other obvious components of empowerment, SPRING’s FNS approach focuses on bundling knowledge and skills around nutrition and small-scale food production as a primary channel through which other important lessons and skills around decision-making and leadership may be taught. The useful nature of FNS lessons is one of the most engaging components and part of what both keeps women engaged and garners support from family and community. The end result? Everyone gains skills around more than just nutrition and food production, and women become more confident, more productive, more empowered and better able to nurture their families and communities. Don't fully understand the link between the food we grow and our nutrition outcomes? I didn't either until I joined SPRING's Agriculture and Nutrition team. Here are my top six resources from six years of SPRING's experience making agriculture more nutrition-sensitive. A well-nourished population cannot be achieved without having all members of households and communities, including male decision-makers, engaged in better nutrition and hygiene practices.